Time has certainly been called for the last time at some of Wroughton’s pubs. As they were closed down so long ago there can be no one in the village today who can remember the “First and Last Chance” or the “Rising Sun”, but they still live on in local folklore. The “Last Chance”, as it was more commonly called, was situated in Priors Hill, and was indeed the last chance to buy a drink before travelling over the Downs to Marlborough, or the first chance to buy one on entering the village from that direction. The “Last Chance” had for many years, members of the Hawkins family as landlords. The 1871 census shows John Hawkins there as grocer, publican and glazier. William Hawkins was the publican and grocer in 1901. This was the last public house in Wroughton to still be brewing it’s own beer after local breweries had taken over the others. The “Rising Sun”, situated in Sun Lane, (next to Haskin’s Garage), was in the hands of the Cowdrey family in the latter part of the 19th Century. The 1871 census shows John Cowdrey as the beer house keeper. 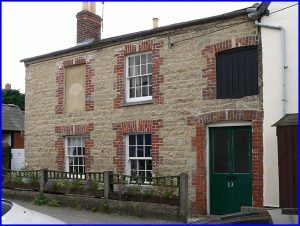 Twenty years later, John’s widow Frances is shown living there with her 19-year-old grand daughter, Annie Pearce, who was listed as barmaid. 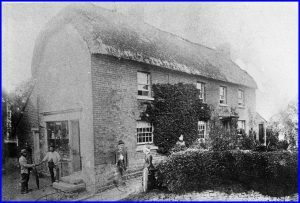 During the “Great Fire” of Wroughton of 1896, the thatched roof of this establishment caught fire. Subsequently the thatch was removed to be replaced with slates. By 1901, Charles Hawkins, aged 36, was being classed as the innkeeper, living there with his wife Annie and their four children. In 1904 the “Balfour Act” was passed by Parliament. Its object was “to secure that the number of licensed houses should be largely reduced”. We can tell from the census returns and the local trade directories that with a population of around 2,500 at that time Wroughton had no less than 10 inns or beer houses, one working men’s’ club and one grocer, Mr W Kerr, who was licensed to sell wines and spirits. Whether or not the 1904 Act had any effect on the closing down of the “Last Chance” and “The Sun” we will probably never know. 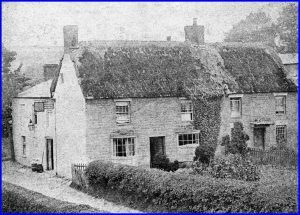 What we do know is that in 1909 the Swindon Police Superintendent had opposed the renewal of the licences to these two houses, and they were finally forced to close in 1913, when the licences were withdrawn, as it was said, there were too many public houses in Wroughton. I am inclined to believe that these two were chosen for closure because they were known to be frequented by poachers, and who were the magistrates at the time?. Why the local large land owners of course! 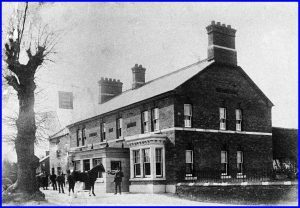 In 1865,the “Ely Inn” was named after the famous racehorse “Ely” who had been trained at the adjoining property of Fairwater Stables. The public house, which had previously been on the site had been a long, low, thatched building called the “Coopers Arms.” During the late 19th Century, according to the reports of the Swindon Magistrate’s Court, the licence of the Ely Inn was frequently changing hands. In contrast, between 1914 and 1961 only two families, the Woods and the Hands, held the licence. To great excitement, a fairground would be set up each year during the late 1940s, in the grounds of the “Ely”. Fortunately we still have the building in the High Street if not the actual pub. In 2012, the “Three Tuns” was sold and became a shop. Back in the 19th Century this would appear to have been the most important hostelry in the village. The local papers often contained reports of meetings, dinners, and auction sales etc taking place there. In 1889 the extensive property passed to Arkells Brewery, and the house was rebuilt around 1900. The ever popular Wroughton Feast with its round a bouts and all the fun of the fair was always held on the land at the rear of the “Tuns”.